As we were returning from errands in Black Mountain on Friday afternoon, what did we come across? A baby goat all by itself out in the middle of our road, about half a mile from the Inn on Mill Creek. It seemed that this little guy had been domesticated by someone; he was as clean as a whistle, and as tame as could be. 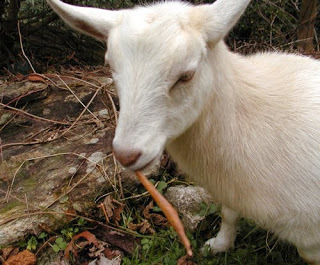 It also appeared that he was dropped off, since goats don’t naturally make their home in our neighborhood (Pisgah National Forest). Deer? Sure. Foxes? Yes. Squirrels and rabbits and myriad kinds of birds? Of course. Bears? Occasionally. 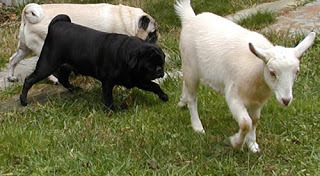 Goats? Well…no. He was a cutie. We named him Buttermilk Biscuit (Buttermilk for short). Buttermilk had started off the day homeless, poor thing, and was very confused at being left in the woods, so we brought him back to the Inn, and after introducing him to Csaba and Bugsy, the innpugs (who seemed mildly interested, having never seen a goat before), we started making some phone calls. No one near us was missing Buttermilk, which was sad. Although he was doing a great job of eating the grass around the Pool Garden, Buttermilk didn’t seem to know not to munch on our roses and lily leaves and spiderwort. Also the chocolate mint. And the hydrangea leaves. And whatever else he could chomp on. 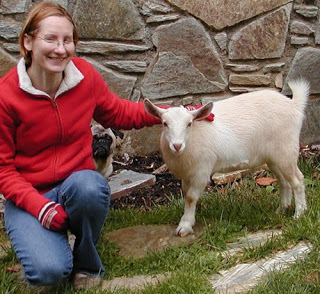 We figured Buttermilk would like a goat-friendly place to live, so we called Peaceful Valley Farm, located south of the Inn, in Old Fort, North Carolina. 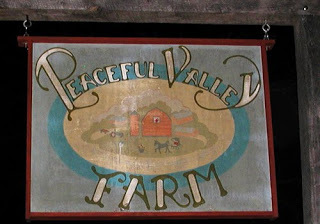 John McEntire and his family own Peaceful Valley Farm, which has been in their family for five generations. They make stone ground grits and cornmeal, and they open their farm to kids on field trips from local elementary schools to educate them about the farming lifestyle and the importance of farming. Sounded like the perfect place for Buttermilk! Mr. McEntire (shown below with Buttermilk and Innkeeper Dave) said he would be happy to have Buttermilk live at the Peaceful Valley Farm, so we headed out to the farm. By 8:00 p.m. Buttermilk was hanging out in his new pen, nibbling on grass, checking out his new goat house and acting very content. 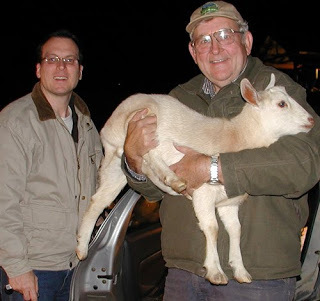 We know Buttermilk Biscuit will be one happy goat at Peaceful Valley Farm. Thanks to the McEntire family for helping us to find him a good home! This entry was posted in Uncategorized and tagged flora and fauna, innkeepers and innpugs by Inn on Mill Creek. Bookmark the permalink. That's just too cool. Way to go. Buttermilk is lucky to have been left in your woods.